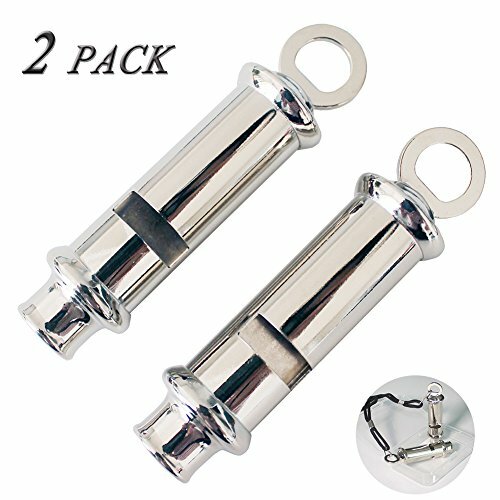 1.It's a 2 pack of sturdy and dependable bobby style whistles. Plating is uniform. It has good tone - not too shrill. Each have a detachable lanyard. 2.It can attract other people's attention in emergency or other special situations. It can be used for outdoor sports, referee, dog training, camping, rowing and first aid or other outdoor activities. You can keep it on you keychain, in your pocket or in your backpack. Or fit on your neck or attach to your keychain. Bobby style whistle is never out of date.The longer it is used, the brighter it is.Can be wiped with cotton or cotton swabs. 2 × Whistles 2 × Lanyard 1×Plastic box. Durablenever : Bobby style whistle is never out of date.The longer it is used, the brighter it is. If you have any questions about this product by Naitondey, contact us by completing and submitting the form below. If you are looking for a specif part number, please include it with your message.